You’ve bought the RV, checked out your destinations and started planning an upcoming adventure. Stocking your motorhome or trailer can cost an arm and a leg if you go overboard, so it’s important to try to stay on track. Here are a few tips to help you get you moving without breaking the bank. 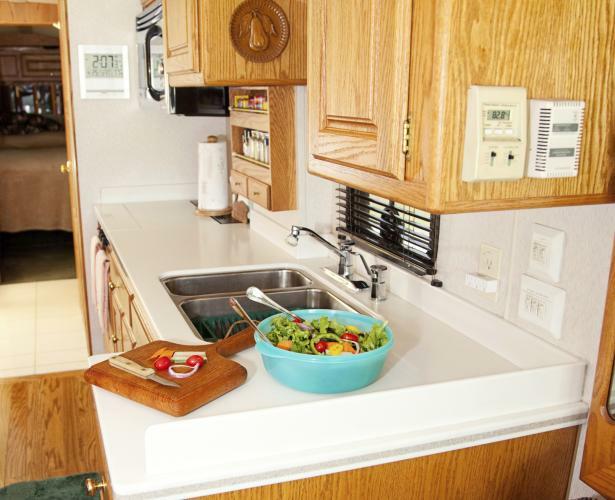 Your RV is an investment and if taken care of properly, can last for years. To help increase its lifespan, it’s important to take the right steps when it comes to cleaning and preserving your investment. Selecting the right products is key, and you should make sure you have a cleaner, a protectant and a fabric guard on hand. To help safely clean windows, countertops or any water-safe surface 303® Multi-Surface Cleaner™ is a great resource. To protect areas that are exposed to the sun’s harmful UV rays like carbon fiber, vinyl trim, decals, slide out seals and interior plastics, apply 303® Aerospace Protectant™. To protect your outdoor fabrics from the harsh elements and prevent soiling and staining on your interior upholstery and window treatments, apply 303® Fabric Guard™. When you are on the road, you likely won’t be dining on fine china, and while paper plates are convenient, they also get to be expensive and take up more room in your small space. You can find reasonably priced tableware and silverware at your local dollar store or discount retailer. Ideally, choose tableware sets that are durable and stack neatly to make the most of your available space. A basic set of silverware can be washed and reused for years to come. It is also worthwhile to buy some low-cost dishrags for cleaning that can be disposed of at the end of each trip. Believe it or not, there is special toilet paper for RVs. RV TP is specially designed to protect and maintain your black water tank and it breaks down faster to avoid clogs. However, don’t flush your money down the toilet buying toilet paper at the pricey RV store. You can find deals online, or visit the camping section of your local big-box discount store. You can also buy regular toilet paper that’s a little on the softer side. To ensure that it’s appropriate for use in the camper, put it through a quick test first. Set the paper in a jar of water. Close the jar and shake it. If the paper starts dissolving after a few seconds, it should be safe for use. Nothing blows your budget faster than getting to your destination and realizing that you don’t have a jacket for a cold night or a swimsuit for an unexpectedly warm day. Look for clearance specials and good deals on seasonal clothes that you’ll leave in the camper. Include at least one jacket, a pair of sweatpants and a swimsuit. This way, you won’t have to worry about sudden changes in weather sending you to the nearest store and paying tourist-location prices. We hope these tips will help prepare you for a successful journey. Drive safely! Good read. Thanks for the important highlight in this posts. Kudos!